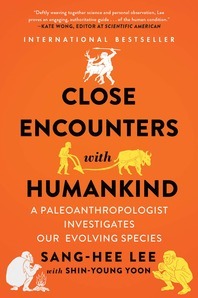 Close Encounters with Humankind - Description | W. W. Norton & Company Ltd. In this captivating bestseller, Korea’s first paleoanthropologist offers fresh insights into humanity’s dawn and evolution. In Close Encounters with Humankind, paleoanthropologist Sang-Hee Lee explores some of our biggest evolutionary questions from unexpected new angles. Amongst other questions, she looks at what fossilised teeth tell us about our ancient life expectancy, what big data on fossils reveals about farming’s problematic role in human evolution and how simple geometric comparisons of skull and pelvic fossils can suggest the origin of our social nature. Through a series of entertaining, bite-sized chapters, we gain new perspectives into our first hominin ancestors, our first steps on two feet, our first forays into toolmaking and hunting, and our continuing evolution. Lee’s curious nature and surprising conclusions make Close Encounters with Humankind a delight to read.